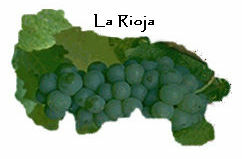 La Rioja is the smallest region of mainland Spain, bordered by Navarre, Castile & Leon and Aragon. One of the most important wine growing areas of Europe, it has a reputation bigger than its land area. Extending along the Ebro River, the region is practically split into two, Rioja Alta which has a great deal of rainfall and has a mild climate, and Rioja Baja which is a hotter and more arid area, similar to Aragon. 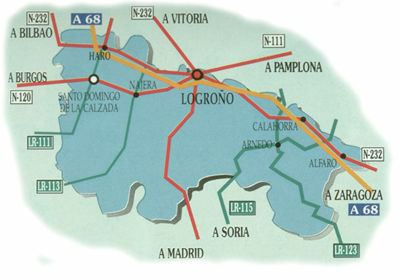 The province' capital, Logroño links the two areas. The most popular places to visit are Logroño and Haro, known for their wineries. The region is rich in natural attractions and offers the visitor a great deal as well as the many opportunities to taste the famous local wines. This region offers great possibilities for rural tourism, and if you like hunting, fishing, climbing or hiking this is where you need to be. From the air, La Rioja looks like a large bowl, a depression surrounded by mountains. The mountains protect the area from the elements which gives the area its own climate that is particularly good for the growing of grapes. Despite the fact that La Rioja produces fantastic wines, some of the best wines in Spain come from the Basque Country. The Rioja wines have a character of their own and in some areas the wine is still fermented in whole bunch and foot treading style. A particular good wine made under these conditions is the Vina Lur. It is best to avoid the cheap wines. A year spent in oak barrels is worthy of the extra cost. La Rioja has a varied history dating back to prehistoric times when it was inhabited by Celtiberian communities. The Romans occupied the area in the second century BC and maintained control for seven centuries. Later, Germanic tribes came down from the north but were expelled in the 8th century by the Moors. During medieval times, thousands of pilgrims were moving around Europe and the Islamic and Christian kingdoms were at odds. La Rioja was a territory disputed over by Castile, Navarre and Aragon. The Catholic Monarchs united the Spanish territory at the end of the 15th century. In 1833 La Rioja became an Autonomous Community. The delights of La Rioja cuisine are as wide and varied as its landscapes. From heavy stews in the north to lighter dishes in the south. Potatoes flavoured with a spicy sausage called chorizo is one of the most typical dishes. Young goat or lamb roasted over vine prunings is another favourite. Trout, Barbel, tripe dishes and cheeses are present in most menus. Fresh vegetables are also in plentiful supply. The region has a wide range of crafts to offer such as the famous, fine furniture, barrels, utensils and wooden carvings, leather goods, tapestries and wicker work. Colourful ceramics and metal work also abound in the area. The mountains of La Rioja are a paradise for hiking, climbing and other mountain related sports. Skiing facilities can be found in Valdezcaray, aerial sports can be practiced in Lardero and water sports in El Rasillo. Cycling is popular throughout the whole region. Hunting is possible in three areas and you can fish for trout, barbel and crabs. For more information about permits, call +34 941 29 11 00. There are four fiestas of interest to the tourist: La Vendimia is held in Logroño on September 21st and is a display of grape-treading, floats and wine-tasting. The fiestas in Santo Domingo de la Calzada on May 12th include parades and dances which extend into the neighbouring villages. La Batalla del Vino in Haro on June 29th is an authentic battle with the 'blood of the earth' used as the only weapon, dousing the participants in a shower of wine. The ancient Danza de los Zancos, held in Anguiano on June 22nd is a day of traditional dancing on stilts.